Yesterday I was on a flying cattle truck – or should I say flying kangaroo truck – between Sydney and Melbourne. As I settled my chin on my knees, I did a bit of work then decided to read the airline magazine, as it was reasonably fresh and generally uncreased or smudged. I find these supposed upmarket magazines fascinating – as much for the ads as the “content“. There were 30 pages of ads before the Table of Contents – 30 pages. Just a note to the digi-kids – magazines, newspapers and books have always called it “Content” and have listed said “Content” in an easy-to-use reference table. “Content” is not a digital invention. In fact in luxury publications, the ads are a valuable part of the content, while the editorial “content” isn’t always worth consuming. There were another 9 pages of ads until the first column of editorial – and it was by the CEO of the airline, so a tad uninspiring. I kept flicking, seeking something to read, when I saw an Ole Lynggaard ad – those in the know will understand what that did to my heart rate. Eventually the ad below took my eye for two reasons. The first was I had never heard of the brand, so my curiosity was tweaked. The second was because as I didn’t know the brand, I wondered where the retreat was located. Alas the ad did not inform me. The content lacked the appropriate information. 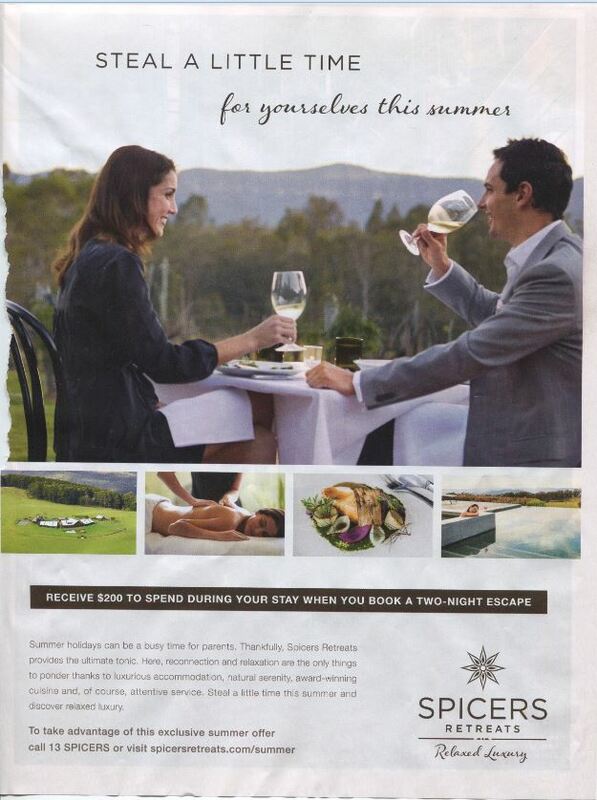 Given I am flying in a plane and don’t have access to the internet to “go online” and do the hard yards myself, you’d think the ad would provide some information about the retreat. Is it one retreat, or are there many? More importantly where are they located – In NSW, Victoria, Australia, New Zealand, Alaska?? Do I drive or fly there? Will I need a passport? The hero shot suggests I need to wear a suit to lunch in Summer. A suit! That’s the last thing I’d want to wear on a relaxing Summer retreat – but that’s just me. I don’t even own a tie. The support images show an aerial view of a “retreat”. The obligatory massage shot, some food or a poultice remedy (I’m not sure) and a person using glassware in a pool – rather dangerous. So I have no idea if it’s for me. But the first line of copy identifies the target audience – parents. So it is people like me. I have two kids on their 8 week school holidays at the moment. The content even refers to the busy time of Summer holidays. But then it moves into a parallel universe – what parents can afford to take time away from their kids during the school holidays? Who will mind the kids? The “retreat” is obviously not for kids – so how do I take time out for myself? Does the retreat provide some sort of kid-friendly lock-up? The reason the ad lacks information, probably has to do with some brand guidelines saying that useful information should be avoided at all costs – just use imagery and puffery. It’s very common in upmarket hospitality advertising. To appease my curiosity and to help me write this post, I did check out the website link on the ad. There’s a few retreats, hence the plural in the name. Most are in Queensland, but one is in the Hunter Valley. I’ve been going to the Hunter for weekends for 30 years – originally pre-kids, now only with kids. I once owned a share in a holiday cottage there, have made wine in 6 separate vintages, had golf weekends and more – but I’ve never heard of Spicers, so am curious. There isn’t a map on the website, but there is an address. 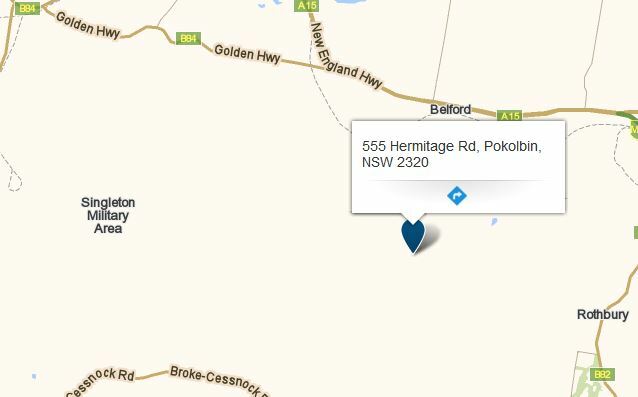 Entering the address in whereis.com reveals the location – next to the Singleton Military Area. Hmmm I think I might retreat from going there for a weekend – kids or no kids. Maybe that’s why the ad didn’t include the appropriate content in the first place? Great stuff Mal. It seems that the interweb is not the only preserve of “content” writers learning by trial & error….